With Apple’s recently announced Apple TV+ streaming video service aiming to compete with established platform providers like Netflix, Crave and Amazon Prime Video, the space is about to become increasingly crowded, even in Canada. With so much to watch and not enough time to actually view it, MobileSyrup has put together a guide to help you figure out what video streaming services are right for you. Below is a list of everything you need to know about the major streaming platforms available in Canada, including pricing and what types of content they offer. Amazon Prime Video Canada is a video streaming platform that is structured differently when compared to competitors. Along with a limited amount of third-party content, the service offers its own ‘Amazon Original’ series, which include The Grand Tour, American Gods and Man in the High Castle. Amazon Prime Canada costs $79 per year or $7.99 per month but includes free shipping, access to Prime Video and Prime Music, plus a few other perks. This is unlike other video streaming services that usually offer a monthly subscription and no add-ons. Additionally, there is also a Prime Student discount that costs $39.99 per year or $3.99 per month. Prime Video Canada offers Standard Definition, High Definition and Ultra HD streaming quality. It is available for computers, Smart TVs, streaming players such as Roku, Fire devices, PlayStation 4, Xbox One, Android and iOS devices. You can purchase Amazon Prime here. Apple TV+ is the Cupertino tech giant’s breakthrough into the video streaming market. Apple is producing its own shows and movies, such as The Morning Show, which stars Jennifer Aniston, Reese Witherspoon and Steve Carell. The company is also working on original content with other popular filmmakers, such as J.J. Abrams, Steven Spielberg and Ron Howard. TV+ will support 4K resolutions with specific platforms. Apple has also confirmed that TV+ is coming to Samsung, Vizio, Sony and LG televisions, as well as Roku devices and even Amazon’s Fire TV. The service doesn’t have a price announced as of yet. Apple TV+ is set to release in fall 2019. CBC Gem offers popular TV shows and movies such as Dragon’s Den, Kim’s Convenience and Coronation Street. The streaming service also produces its own shows such as My 90-Year-Old Roommate and Narcoleap. Users can also live stream 14 local CBC TV programs. It’s important to note that this service only supports 720p resolution on all platforms. The service is available on iOS, Apple TV, Android, computers and Chromecast. Gem has two membership packages — a free and premium version. The difference between the two packages is that the paid version gives you complete ad-free programming and access to the CBC News Network’s live 24/7. CBC Gem Premium costs $4.99 per month and is available here. American television and radio network CBS launched its own streaming service in Canada called All Access. CBS All Access focuses on its TV programs, such as Survivor, NCIS and Jordan Peele’s new anthology series The Twilight Zone. The service can be streamed on desktops, iOS, Android, Roku, Chromecast, Apple TV and Android TV. CBS is offering one month free for new subscribers. Once that grace period is over, All Access will cost a monthly fee of $5.99. You can join CBS All Access on its website. 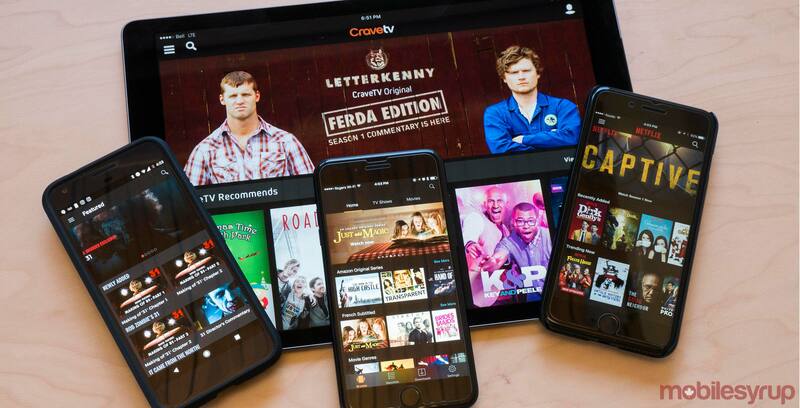 Crave is Bell Media’s video streaming service. The base level Crave subscription offers a limited amount of original content like Letterkenny. Crave also holds the rights to stream current HBO content in Canada, such as the popular TV series Game of Thrones, as long as subscribers pay an additional fee. Crave supports up to 1080p resolution on newer Apple TV’s, Xbox One and both iOS and Android. That said, the service tends to experience issues with streaming at a consistent bitrate with some content. For April 2019, Crave is bringing Game of Thrones’ final season, Doom Patrol, Crazy Rich Asians and more to the platform. Crave starts at $9.99 CAD. The Movies+HBO add-on is priced at $9.99, with Starz content costing $5.99. If you purchase all of the add-ons, this brings Crave’s total monthly cost to $25.99. The service is available on computers, Apple TV, Android, iOS, Chromecast and Xbox One. You can subscribe on Crave’s website. DAZN is a U.K.-based streaming service focused on HD sports livestreams. The platform broadcasts sports leagues such as the MLS, NFL, European soccer, ICC Cricket and more. However, these streams are sold as a collective package, which means that you cannot individually purchase broadcasts for a specific league. DAZN offers a monthly subscription, which costs $20 and a yearly package priced at $150. Both come with one month free for new customers. The service is available on streaming players, desktops, iOS, Android, PlayStation 4 and Xbox One. However, some leagues do offer their own services that you can stream games on such as MLB At Bat, Rogers NHL Live and NBA League Pass. MLB At Bat has two subscriptions, a yearly package that costs $19.99 and a monthly package of $2.99. The service is on iOS, Android and Kindle Fire. Rogers NHL Live has two packages as well. There’s a Stanley Cup Playoff pass, which costs a one-time fee of $74.99, and a monthly pass, which costs $29.99. NHL Live is on iOS, Android, Xbox One, PlayStation 4, Roku and Apple TV. NBA League Pass offers three different tiers of content. The ‘League Pass’ is $29.99 per month and covers NBA’s regular season, playoffs and finals. The ‘Team Choice’ monthly subscription is $19.99 a month, but only covers NBA playoffs and finals if the team you pick advances. ‘Game Choice’ offers specific games for $9.99 each month, but does include NBA playoff and finals. However, NBA League Pass excludes Raptor games and other matches provided by national broadcasters. DAZN also now holds the exclusive rights to stream 380 Premier League matches in Canada. League Pass is available on iOS, Android, Chromecast, Roku, desktops, PlayStation 4 and Xbox One. NBCUniversal offers its own streaming service called Hayu, which streams content in 1080p. Hayu focuses solely on reality TV shows such as Keeping up with the Kardashians and The Real Housewives of New York City. However, the service doesn’t feature any movies or other genres. Hayu has a monthly subscription cost of $5.99, with the service offering one month free for new subscribers. The streaming service is available on iOS, Android, Apple TV, Chromecast, Fire TV, Roku and web browsers. You can register for the streaming platform here. Netflix is one of the most popular video streaming service worldwide, let alone Canada. The platform offers a variety of original TV series and movies such as Stranger Things, Black Mirror and Riverdale (which is filmed in Vancouver). Netflix is launching another season of Chilling Adventures of Sabrina (filmed in Vancouver), Split, Brie Larson’s Unicorn Store and more in April 2019. The streaming service offers three subscription tiers, with the ‘basic’ plan costing $9.99, ‘standard’ costing $13.99 and ‘Premium’ costing $16.99. Netflix’s top tier allows users to stream specific content in 4K. The streaming service is on computers, Smart TVs with Netflix built-in, streaming media players such as Roku, PlayStation 4, Xbox One, Android and iOS devices. You can subscribe on Netflix’s website. Shudder is AMC’s live streaming service focused on the horror genre. The platform streams most of its content in 720p and some in 480p resolution. The platform has TV shows, movies and originally produced content such as Channel Zero, Mayhem and Night of the Living Dead. Shudder offers a free seven-day trial, with its yearly membership costing $49.99 and monthly package costing $4.99. The service is available on iOS, Android, supported streaming players and Xbox One. As an alternative to DAZN, Sportsnet NOW also offers High Definition livestreams of different sports leagues tailored toward Canadian viewers. The sports streaming service covers leagues not available on DAZN, such as NHL (Sportsnet exclusive matches), NBA (including Raptors games), Indy Car, MLB and CHL (Canadian Hockey League). Sportsnet NOW also provides streams to other programs such as Hockey Night in Canada and Rogers Hometown Hockey. Supported devices include desktop, iOS, Android, Apple TV, Chromecast, PlayStation 4, Xbox One and Amazon Fire TV. The service offers three subscription options: Sportsnet NOW+ Annual, Sportsnet NOW+ Monthly and Sportsnet NOW Monthly. The NOW+ packages offer additional Premier League, Bundesliga and FA Cup soccer games, Gallagher Premiership Rugby and IndyCar races. Specifically, Sportsnet NOW+ has no regional blackouts for NHL games, while the basic Sportsnet NOW does. Sportsnet NOW+ costs $249.99 per year, NOW+ Monthly costs $27.99 and regular NOW Monthly costs $19.99. The popular video streaming site’s subscription is different when compared to other streaming platforms available in Canada. YouTube Premium offers original movies and series produced by different YouTube content creators such as Weird City and Lifeline. The service also supports video quality up to 4K depending on what content you’re streaming. YouTube Premium is available on Android, iOS, computers, Smart TVs, PlayStation 4, Xbox One, Nintendo Switch, and streaming players. This service costs $11.99 per month and is available here.